Last weekend, I had a wonderful time shooting a family session with Travis and Elizabeth’s family, and the rain mostly held out for us too! This one was especially wonderful for me, because Travis was a friend of mine in high school, and I remember when he and Elizabeth were just dating. Elizabeth went to a different school in town than we did, but she often came to ball games and school events with Travis. I remember her being very quite back then, extremely sweet natured, and that I was always so jealous of those beautiful eyes and PERFECT SKIN she has! Now, she’s just as pretty as she was back then, and I’m so glad I’ve gotten to talk to her more- she’s such a sweet person! I also remember running into them when Audrey was just a teeny tiny baby- she was an absolute doll! I just can’t believe she’s already ten years old, but I’m absolutely not surprised that she grew up to be so beautiful! She has this gorgeous blonde hair, even considering both of her parents have darker complexions, and a smile that could light up a room. It’s been many years since we were in high school, and I’ve only ran into Travis and Elizabeth a few times since that time, so I was surprised and excited to find out at Dave and Autumn’s wedding (where Travis was the best man- in fact, I have a lovely, manly photo of him wearing Autumn’s veil) that they’ve since had another beautiful addition to their family since I’d last seen them- adorable little Lily! Lily is absolutely beautiful, just like her big sister Audrey and their mommy Elizabeth! I got such a kick out of her- The first leaves are just starting to change and fall, and as we were out walking around, she was so intrigued with the pretty leaves on the ground. She kept picking yellow and red ones up, and ended up with quite the bouquet of them by the end, which her mommy tucked into their bag for her 🙂 I’ve become quite accustomed to the fact that small children are usually shy, particularly when a stranger is pointing a camera at them, so I was just shocked at how much of a little model she was, and how much she talked to me! I think one of the funniest things to me (and I’ve been encountering this OFTEN as I get older and people I grew up with are starting families of their own)… Travis was always such a goofball in high school. I remember he and Dave and a few other guys having daily sneezing contests walking outside on our way back from lunch, and the fact that he was always goofing off. Now that guy is a dad and husband! And I can tell, he’s a wonderfully loving father and husband. I was so happy to shoot this wonderful little family’s portraits, and to catch up a bit in the process! 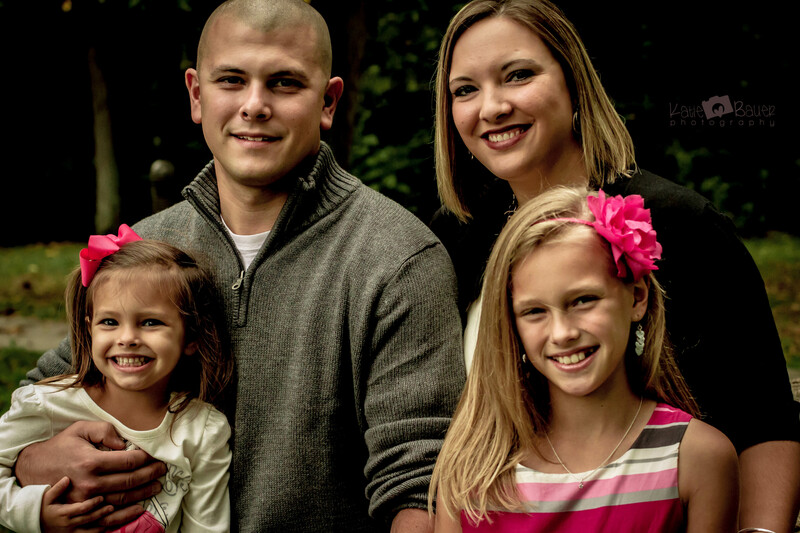 Now, take a look at Travis and Elizabeth’s beautiful little family! FREE THANK-YOU GIFT TO MY 2013 CLIENTS!! A Year-end post on gratefulness, success, and other happy things. The Meadows Family [… on Andrew! The Meadows Family [… on Izzy’s 6 Month Shoot!